At a later point, Childish Gambino uses a Kalashnikov patterned automatic weapon to gun down a church choir, which viewers have interpreted as a reference to the 2015 Charleston church shooting. In both instances, a child appears from off-screen holding a red cloth, on which Gambino gently lays the weapon used, while the bodies are simply dragged away. Viewers have interpreted this "as a reference to Americans' willingness to protect gun rights over people". Scenes also involved children using their cell phones to record the chaos happening in the video, while Gambino sings the lyrics "This a celly / That's a tool". Martha Tesema, writer for website Mashable, stated that "cell phones have been used as tools to broadcast police shooting, rioting against, or choking black people in this country". Throughout the video, numerous vehicles from several decades ago are featured, many of them with their hazard lights flashing and the driver's side door ajar, which critics interpreted as representing fatal police shootings during traffic stops, particularly the shooting of Philando Castile, who was shot while in a 1997 Oldsmobile; others have interpreted that the older model cars represent the relative lack of upward mobility of African Americans. American singer SZA makes a cameo appearance towards the end of the video, seated atop one of these vehicles. The video ends with Gambino in a darkened portion of the warehouse, fearfully running towards the camera while being chased by several white people. Viewers have said this resembles scenes from the 2017 film Get Out. 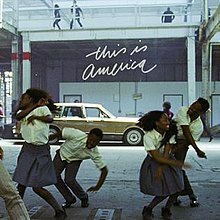 Awards for "This Is America"
This page was last edited on 22 April 2019, at 08:10 (UTC).